If you are like most parents, you want to raise your children well – to develop their mental and physical aspects completely. Most people know that music education helps grow children’s brains. Early training develops language and reasoning areas of the brain. It helps develop the ability to form mental pictures of things. Creative thinking and problem solving are also developed. Studies show that scores on tests like the SAT are better from students exposed to music lessons. Performing helps kids learn to conquer fear. But musical instruments can be expensive, and many are too delicate for pre-school aged children. How can you expose your pre-school and grade school age children to musical instruments without spending an arm and a leg? Here are a few thoughts on giving your child access to music on a budget. Clap sticks from decorated paint stirrers. Ashely’s husband over at Make It – Love It, made really cool looking cardboard guitars for their kids – much better looking than the shoebox guitars you usually see. They are made by tracing a guitar shape onto hefty cardboard, with pencils to hold the rubber band strings up off the board. She gives a step by step on her site. Alex Duncan shows you how to make a one note balloon bassoon using 40 mm pvc pipe, garden hose, duck tape and a balloon in a You Tube video. It sounds pretty darn good too. Busy Bee Kids Crafts has a bunch of ideas, one of which is making paper plate tambourines. For the more sophisticated, try crafting a vegetable instrument or band. Linsey Pollak is a musician that has figured out how to play a carrot! Watch as he constructs a carrot clarinet and plays it – it sounds like a real one to me! Check out your local school to see if they have a music program for the kids. My grandson gets to play various instruments in his 3rd grade music class, without having to purchase them. Craigslist – a quick search in my area under musical instruments looking for keyboards showed them from $30 and up. Garage sales – I found a guitar for $5.00 once at a garage sale and bought it for my grandson. Pawn shops – there are even some that specialize in musical instruments. Relatives – Great Uncle Joe may still have that trumpet he used to play and might like to donate it to a future generation! Musical instrument exchanges – some sites let owners list and buyers browse used instrument sales. Just search on exchange musical instruments. We rented our son’s alto saxophone while he took lessons in high school. Later we went ahead and bought it from the shop – but that wasn’t a very inexpensive solution! Experimenting with musical instruments should be part of every child’s growing up experience, at least in my book. I tried both the piano and the violin in grade school – unfortunately neither stuck. As an adult I tried out an acoustic guitar and managed to get far enough to at least toughen up my finger tips! What suggestions do you have for parents to give music experiences to their children without breaking the budget? I really like singing but unfortunately, we are less fortunate when I was a child so I never developed it. Anyway, because of that, when my kids will be interested with music, I’ll definitely support them. I wish I could sing. As I get older, my voice grows worse! My kids have little instruments – drums, a kazoo, maracas…. They also try to play my piano. It’s so cute! Are you teaching them to play the piano? My Mom tried, but it didn’t take with me. Playing a musical instrument is definitely something I wish I would have master when I was young. It’s one of those things that seems boring at the time, but you realize it’s actually really cool and tons of fun when you get older. True, as an adult I tried to learn to play the guitar. I even took a few lessons, but the young kid trying to teach me didn’t have much patience. He thought I should just start free styling, but I didn’t even know chords yet! I am a huge fan of this article being a former classroom music teacher and now the owner of a guitar studio. Music has taught me a lot about life and continues to in my 40s. If a child is going to have guitar lessons, however, the instrument ought to be properly sized for the student and a guitar should never have steel strings for beginners. Lessons are a waste of time otherwise, since steel strings hurt and inappropriately sized instruments create poor technique, both of which discourage practice which is where all the MAGIC really happens,such as the brain development and conquering fear stuff. Good points. When I tried to learn guitar I was using a cheap $5 one from a garage sale. It took weeks to toughen up my finger tips for the steel strings. Ha! Marie, you are tougher than most;) A Yamaha nylon string can be purchased for about $120 or less, but used who knows? $25, maybe less? They are great for beginners and come in 1/4, 1/2, 3/4 and full sizes. They may even have 7/8, but they ae not really necessary in most cases;) Hope this helps someone! 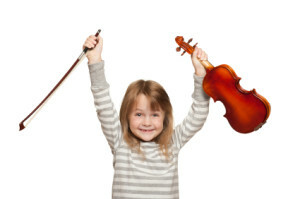 I think learning music is great for young kids…though it really depends on the teacher too. I took piano lessons growing up but didn’t really enjoy it and never practiced like I was supposed to. I kind of regret it now. I bought a keyboard and am trying to pick it back up. Hopefully I can teach my kids to play too (no kids yet but very soon!). Keyboards are fun, but easy to ignore. Not at all like a huge piano stalking your living room! Definitely a worthwhile investment! However, it’s important to recognize when a child has real talent and possibly invest in private lessons. True, but in order to discover the talent somehow you have to expose them to the music. I homeschool. My oldest plays violin and piano. I taught him for several years before outsourcing it–it was just to exhausting, and having someone else do that one subject was extremely liberating, though it’s expensive. The piano was my great-grandmother’s. She won it in a writing contest! What a heritage and good for you for home schooling. That is hard work! better trying to find a used instrument on auction or ads.